This dish provides one-third of your recommended daily intake of magnesium – essential for healthy bones and the conversion of food into energy. 1. Bring a small saucepan of water to the boil and blanch the green beans for 1 minute. Drain and run under cold water so they retain their colour. 2. Heat a small frying pan and add the pumpkin seeds. Move the seeds around the pan to evenly toast them for a couple of minutes then remove from the heat and set aside to cool. 3. 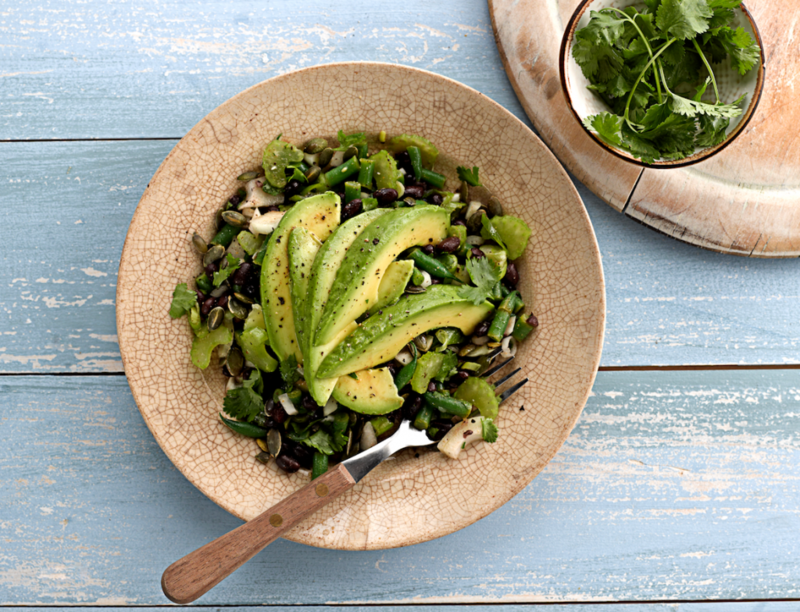 Place the black beans in a medium mixing bowl with the green beans and all the remaining ingredients other than the avocado. Combine well and season. 4. Serve the bean mixture in small bowls and top with slices of avocado.